We’ve eaten summer salads for days. I’ve blended them into smoothies. I’ve even baked them into pancakes with questionable success. Pickles? Done. And I don’t even love pickles. What do I love? Warm smooshy things in bowls that don’t take forever to make. Bonus points if The Muffin likes it. Extra bonus points if he can feed it to himself. Super extra bonus points if leftovers are still tasty. What fits the bill? 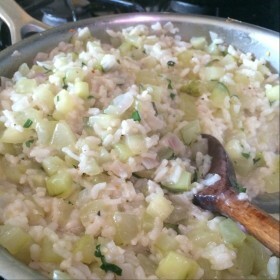 Cucumber risotto. “EWWWWWWWWWWWWW!”, you say? “Delicious!”, I counter. “EWWWWWWWWWWWWWWW!”, you still say. Well, everyone’s entitled to her opinion, but this risotto is sweet and subtle and creamy and lavender/green. 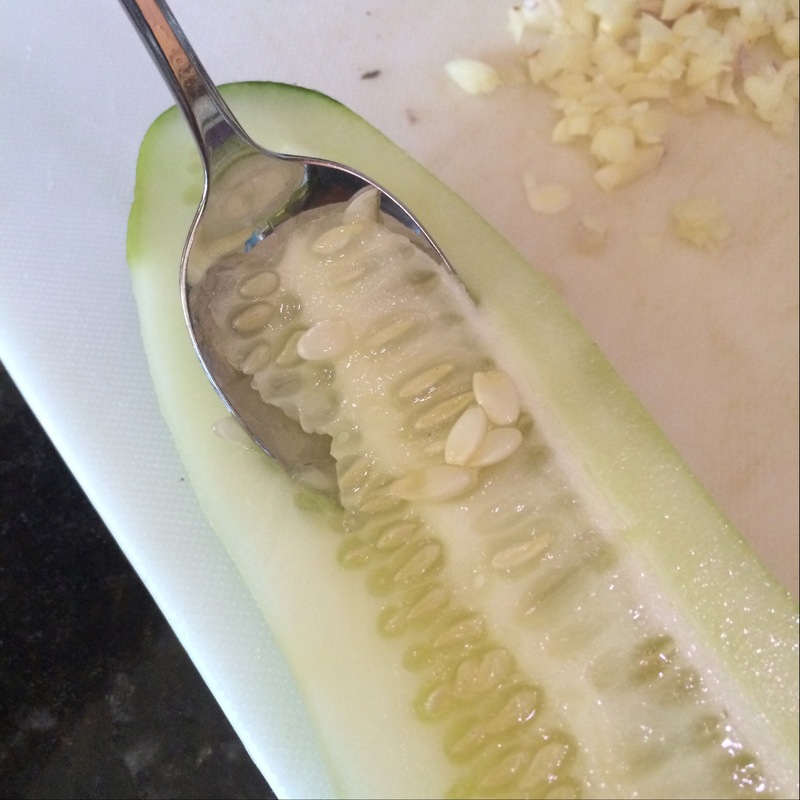 If you still don’t trust me, substitute zucchini – I have and it’s great. Apologies (once again) for the phone photos. We’ll figure out this technology thing, I promise! In a heavy skillet, melt half the butter (1 TBsp) over medium-low heat. 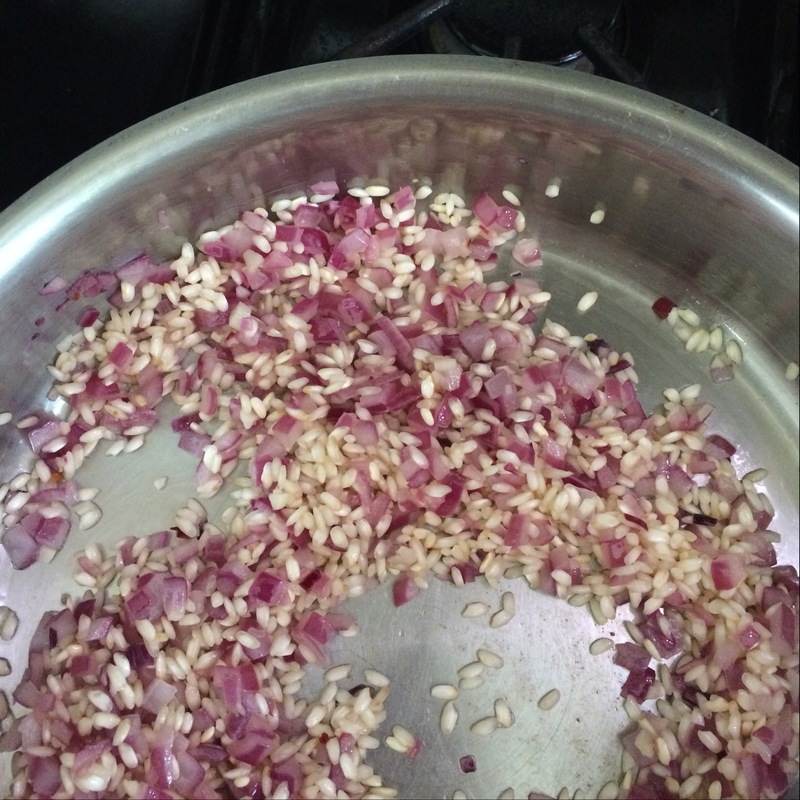 Add the red onion and sweat (cook slowly without browning) for 2 minutes; add the garlic and cook for another minute. 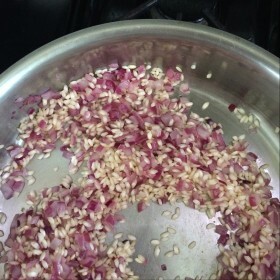 Thoroughly stir the rice into the onion mixture, so that each grain is coated with butter. Add the cucumbers and crushed red pepper flakes. Stir well, then use your spoon to smooth and level the rice mixture in the pan. Gently pour a generous 1 cup of hot stock evenly over the rice mixture. Don’t stir. Just let the rice absorb the liquid, which should take about 15 minutes. When all the liquid has been absorbed, stir and repeat with another generous cup of stock. Reduce the heat if the last batch was absorbed in less than 15 minutes. Stir in the last 1/2 cup or so of stock. 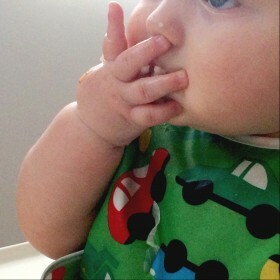 Keep your eye on the risotto this time. It’s done when the rice is tender, but not mushy. If it’s the right consistency, but there’s still liquid in the pan, raise the heat to boil it off. If the rice isn’t ready when all the liquid is gone, add a little hot water and keep cooking. When the rice is perfect, stir in the remaining butter (1 TBsp) and salt, pepper, and herbs to taste.